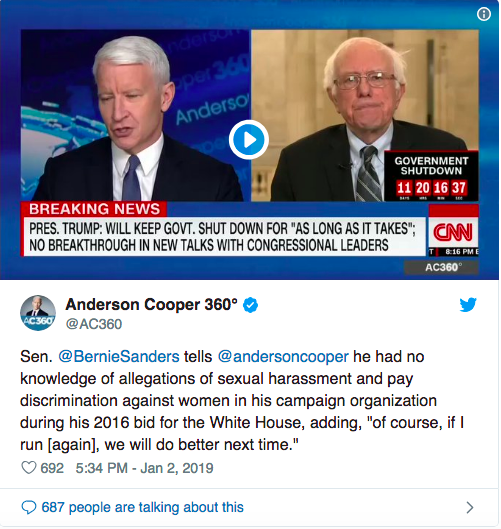 The Vermont senator told CNN that he wasn’t aware of sexism and discrimination complaints during his 2016 presidential bid, but would take steps to address them. Sen. Bernie Sanders (I-Vt.) said in an interview Wednesday that he had no knowledge of multiple allegations that members of his 2016 presidential campaign harassed or discriminated against female campaign workers. The claims have been circulating in recent weeks as the lawmaker mulls a second bid for the White House. In an interview with CNN’s Anderson Cooper, Sanders said that his campaign for the Democratic nomination, which he lost to rival Hillary Clinton, exploded in size over several months as his team hired more than 1,200 employees. Sanders suggested that disorganization may have led to instances of inappropriate behavior within his campaign. “I’m not going to sit here and tell you that we did everything right in terms of human resources, in terms of addressing the needs that I’m hearing from now, that women felt disrespected, that there was sexual harassment which was not dealt with as effectively as possible,” said Sanders, who is actively cultivating support for a 2020 bid. His comments come on the heels of several reports from more than two dozen women working on the 2016 campaign. A story published Wednesday in The New York Times included several detailed accounts of employees reporting harassment or issues with large pay gaps between male and female staffers, only to have campaign leaders discount them. A letter to Sanders from campaign alumni last month asked him to set new goals for future campaigns. The former workers also requested a meeting with the senator and his advisers to address their issues with his 2016 bid. The Times notes that sources said their claims reached the desks of several leading campaign officials, but it’s unclear if Sanders knew of them at the time. On Wednesday, Sanders said his campaign for the 2018 midterms featured a new “gold standard” that other lawmakers should be working toward. “What I will tell you is that when I ran for re-election in 2018 in Vermont we put forward the strongest set of principles in terms of mandatory training, in terms of women, if they felt harassed, having an independent firm that they could go to, and I think that’s kind of the gold standard for what we should be doing,” he said.